I love Classical Conversations! My children are going into our fourth year (5th and 7th grades respectively) and I only wish I'd discovered this fabulous curriculum earlier. My daughter earned Memory Masters this year. I wanted to honor her hard work and thought some of you moms might like to do so too. I hand stamped Memory Master around the curve of the disc then added CC in the middle. Charms include silver teardrops on which I stamped the cycle you want, an antiqued silver key and open book, and a 6mm shiny Swarovski crystal. 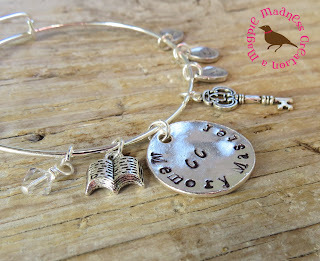 Discs are hand stamped by me in a delightful "not-perfect" style:) Silver bracelet is 2.5" in diameter but can be adjusted.